The 35.7 metre Su Marine motor yacht project CMY36 has been launched in Turkey and named Laniakea. 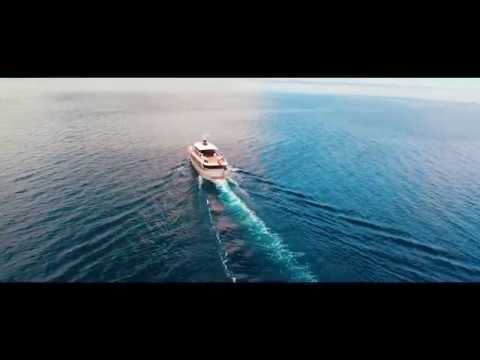 As the video below reveals, this classically-styled motor yacht features rounded portholes and plenty of timber detailing. Osman Tanju Kalaycıoğlu of Taka Yachts was responsible for her exterior design as well as the naval architecture. Laniakea’s vital statistics include an eight metre beam and a maximum draught of 2.2 metres. Built from a cold molded wood/epoxy hull and superstructure at the Istanbul-based yard, this tri-deck displacement yacht boasts a total interior volume of 275GT. On-board guest accommodation is split between seven cabins, while her crew quarters allows for a staff of two. Al fresco relaxation options include her foredeck seating area, sheltered cockpit and extended superyacht sundeck, which boasts plenty of tender storage space back aft. Power comes from a pair of 591hp diesel engines that push Laniakea to a cruising speed of 11 knots, topping out at 13.5 knots. What’s more, her total fuel capacity of 30,000 litres should ensure extended cruising opportunities are on the cards. Further details are few and far between, however it is understood that the project was completed on time following a two-year construction schedule. Laniakea is the first yacht to emerge from the Turkish yard since the 35.6 metre ketch-rigged sailing yacht In Love was launched back in 2014.